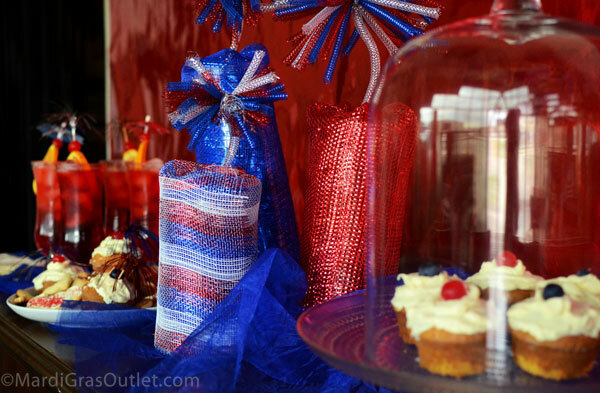 Create dynamite decorations for your Fourth of July party with these precious faux firecrackers! 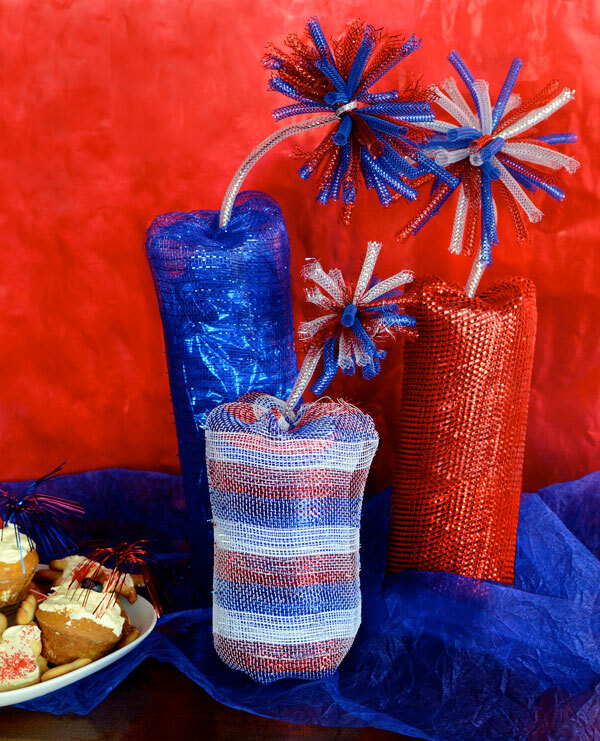 Our Deco Mesh Firecrackers are a fun and easy to make. 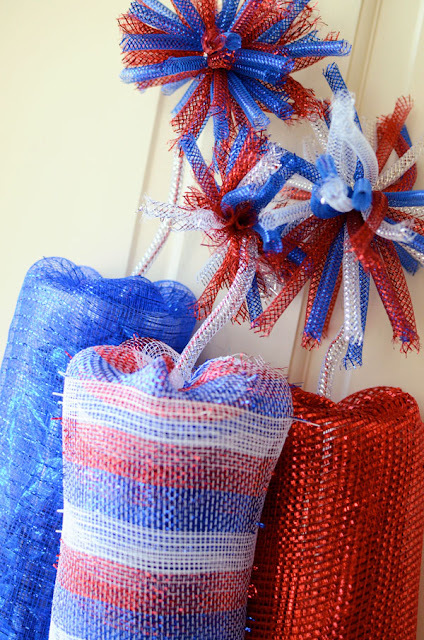 Use them as a festive Fourth of July door decoration or centerpiece for a summer soiree! They can be made out of metallic, solid, or striped Deco Mesh. Add a weight to them to hold down table clothes or fill with candy to become a fun party favor. Follow the DIY Tutorial below for simple step-by-step instructions. 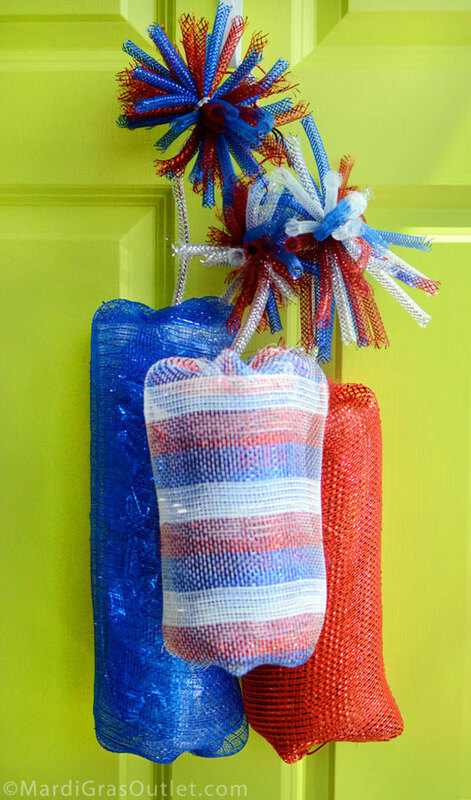 Deco Mesh firecrackers as door decorations. We love the pop of red, white and blue against the bright green door! To purchase these products from www.mardigrasoutlet.com, click on the individual product link below or click HERE for page listing of all products. 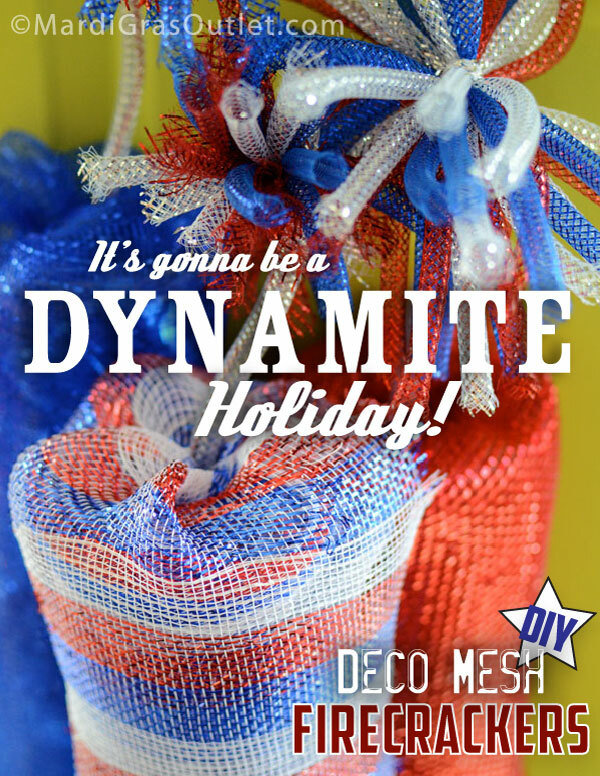 For more dynamite deco mesh colors, here is a link to our full range of colors of mesh. This project takes approximately 1-2 hours, start to finish. The estimated total cost of supplies for this decoration is about $35-$40 depending on the mesh style. Using a single mesh color choice instead of three will lower the cost. There will be product left over for each material, approximately 3/4 of a roll of each mesh color used, and much of the Deco Flex Tubing Ribbon. 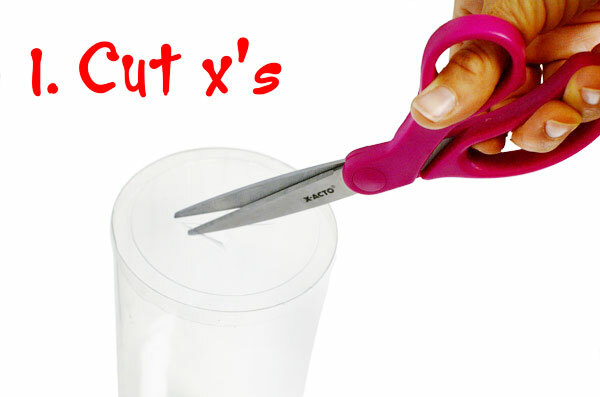 Cut X's in the middle of each of the two end caps of the clear cylinder. This spot is where you will eventually tuck in the Deco Mesh. 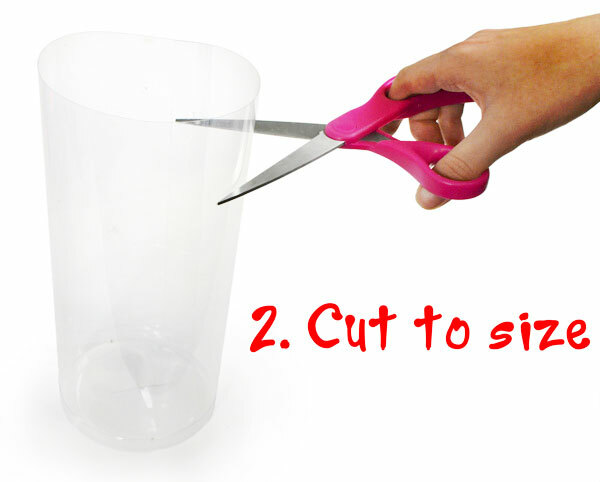 The clear cylinders come in 13" tall lengths and can be trimmed to any size with scissors. For our projects both as a wreath and as a centerpiece, we used 3 cylinders; the first we kept at 13 inches, the second we trimmed to 10 inches, and the last we cut down to 7 inches. After trimming to the desired length, put the caps onto the cylinders and tape to secure. 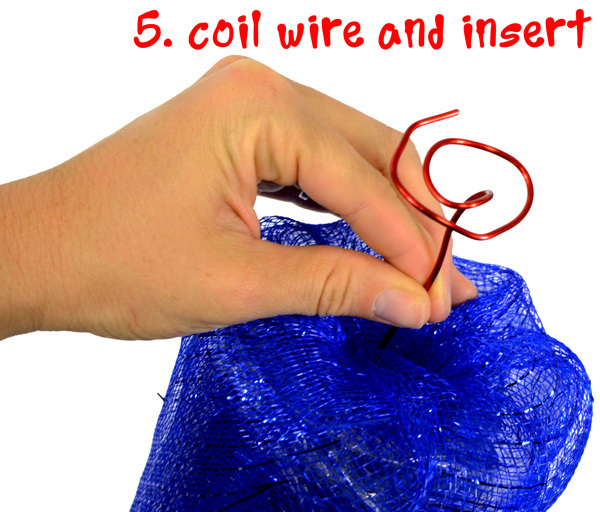 Cut three pieces of red or silver aluminum wire. Each aluminum wire should be about 10 inches longer than the cylinder heights. Our wires were approximately 23", 20" and 17" each. You will need extra wire length both for the base of the cylinder and for the "spark" at the end. 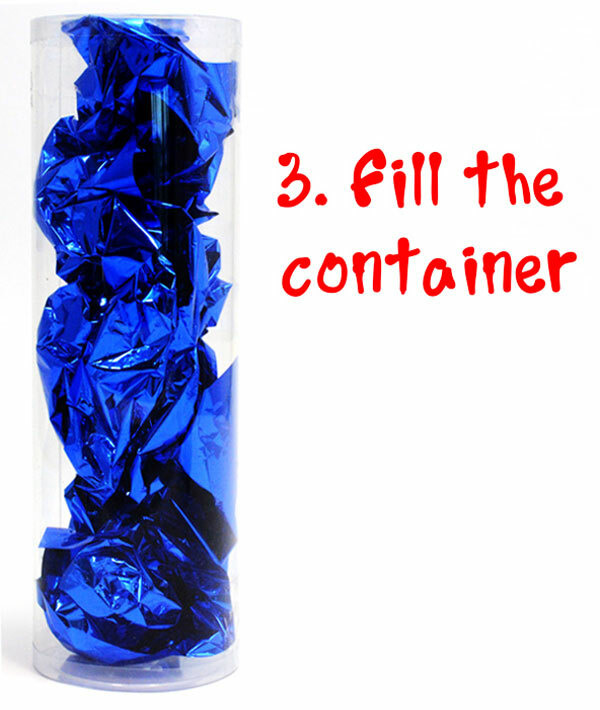 If you are using a sheer mesh, you will want to fill the clear container. When using a more opaque wrap, you can skip this step. 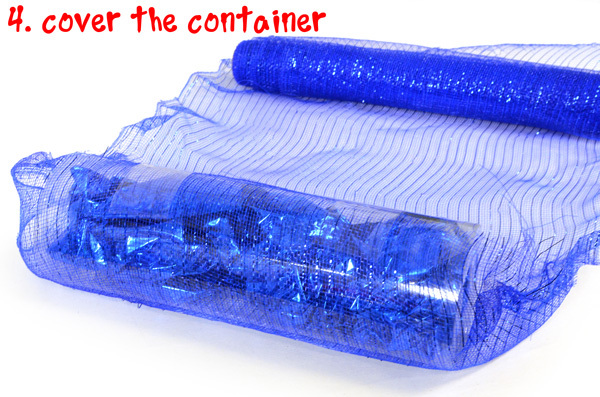 We filled our cylinders with a matching foil, available here in blue or in other colors at www.mardigrasoutlet.com. If you are using the firecrackers as a centerpiece we also recommend adding a weight at bottom, like these. If you plan on giving your firecrackers away as party favors, they can be filled with your favorite candy or party favors! Tape the Deco Mesh down to the center of the clear cylinder so that there is an equal amount of mesh on both sides, and roll it tightly. You want approximately 2 layers of Deco Mesh over the cylinder. Cut the Deco Mesh and tuck the ends it into the base (bottom) end first. Insert the aluminum craft wire through the X in the bottom and make a 1.5"-3" coil at one end so that the wire will not pull completely through. Push the wire through the container, working around your filler. Leave a straight portion of the wire coming out the top X for the fuse. Next tuck the Deco Mesh into the X cut into the top of the cylinder. 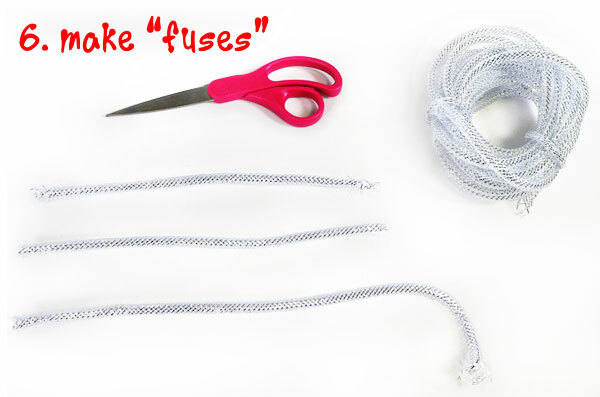 Cut "fuses" from the silver Deco Flex Tubing Ribbon that are at least 7 inches long. Place it over the exposed aluminum wire at the top and tuck 1 inch or more into the X on the cylinder top. 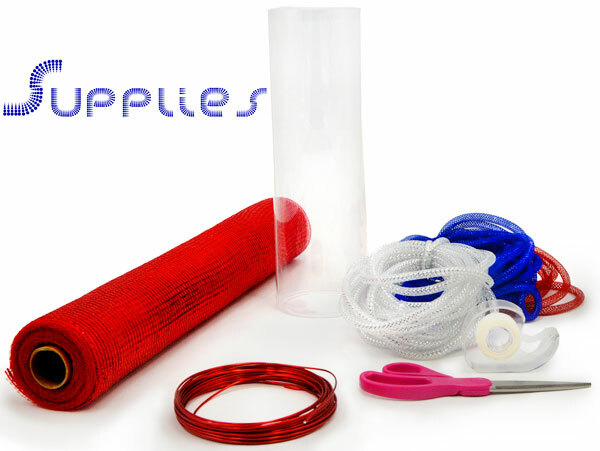 Cut approximately twenty pieces of blue and red Deco Flex Tubing Ribbon - 5 or 6 inch in length per "spark". Tie them together at the center with a piece of flex tubing. They don't need to be even lengths. You can trim them after you've attached it to the firecracker. Twist the end of the silver wire fuse around the center of your spark. leaving the excess fuse pointing upwards. 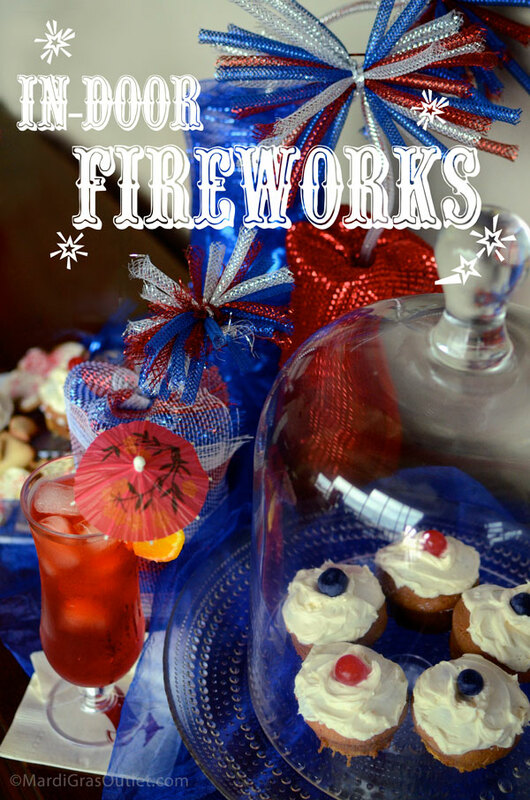 Repeat the process for each firecracker with your chosen color. 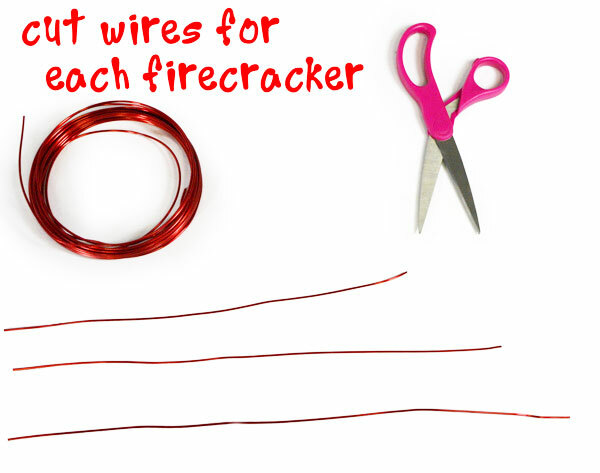 If you created multiple firecrackers, you can twist them together at the top from the excess fuse lengths before hanging as a wreath. We've used our large firecrackers here in a table setting. For a table runner we used Blue Crinkle Sheer, available in many colors! Hurricane cocktails made with New Orleans own signature Pat O' Brien's Hurricane drink mix round out the party. 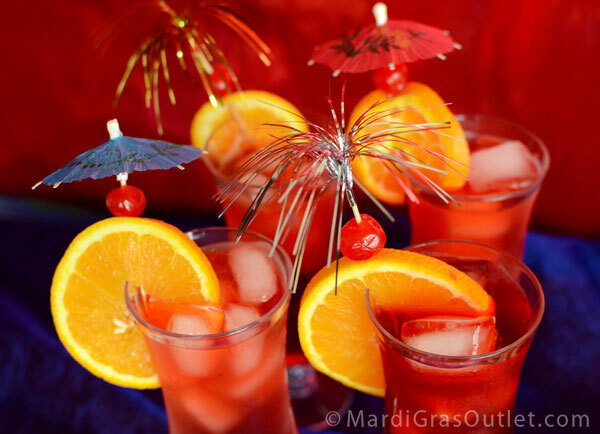 Topped with oranges, cherries, red and blue drink umbrellas and foil party picks the Hurricane glasses look refreshing and patriotic! 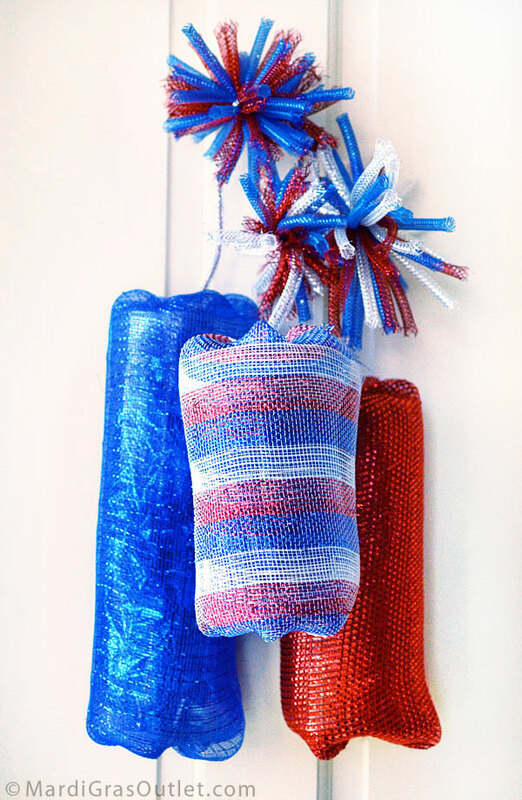 These indoor fireworks are the perfect Deco Mesh decoration for your Memorial Day, Fourth of July Celebration, or Birthday Party for your Independence Day Baby! Have a DYNAMITE Fourth of July!